PM urges solidarity among Muslim nations to face challenges. ISLAMABAD: Prime Minister Imran Khan on Monday stressed the need for cooperative relations among Muslim countries to deal with problems they faced. 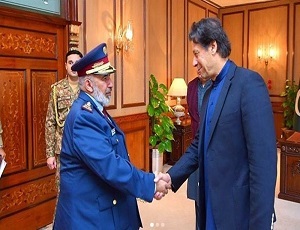 Talking to Qatar’s Chief of Staff of Armed Forces Lt Gen Ghanim Bin Shaheen Al Ghanim, who called on him at the PM Office, Mr Khan “expressed his desire for amity, friendship and good relations among Muslim countries and solidarity to confront common challenges”, according to an official statement. Pakistan and Qatar have strong defence and intelligence relations and experts say the two countries are working to further strengthen that relationship. The two sides have been working together for Afghan reconciliation and have regularly coordinated on the issue. More recently, diplomatic observers say, Doha and Islamabad were in touch with each other before the two latest publicly known direct interactions between the US and Taliban. It is believed that Taliban’s upcoming meeting with US Special Envoy for Peace and Reconcilia­tion Amb Zalmay Khalilzad was the major agenda item during Gen Ghanim’s Pakistan trip. Qatar has been hosting the Taliban’s political office since 2013. Both Amb Alice Wells and Amb Khalilzad held their meetings with Taliban representatives in Doha. The statement, issued by the Prime Minister Office on Gen Ghanim’s meeting with PM Khan, said the discussions centred around bilateral relations, particularly trade and manpower export aspect. Mr Khan, the PM Office said, expressed satisfaction over the steady growth of bilateral relations and underlined the commitment of his government to build mutually beneficial relations with Qatar. “Referring to 73 per cent increase in Pakistan’s exports to Qatar, following launching of the Hamad Port and its linking with Karachi Port through a ferry service, he (PM Khan) expressed confidence that the bilateral trade will further expand in coming years,” the statement said. Mr Khan thanked the Qatari leadership for agreeing to import 100,000 workers from Pakistan and welcomed the establishment of abour Offices by Qatar in Karachi and Islamabad, to streamline and expedite the recruitment process.